With the advent of digital marketing the term “In-bound” marketing has become popular in describing how “Content Marketing” works. However, there is some debate about exactly what is considered “In-bound” Marketing and the reverse of out-bound marketing. If you look at more traditional descriptions the terms push vs. pull marketing come into play. I am not going to attempt to debate what should be considered inbound vs outbound. However, I will describe what one might consider the two sides of marketing in a digital age. The first side is what I would refer to as the “Being Found” side of digital marketing. The main foundation of “Being Found” marketing is search marketing, which consists of making sure your company has visibility on the search engines when potential customers begin the process of looking for a company that can provide what you sell. This “Being Found” side of marketing is important especially in the B2B market, where the majority of purchases are being made out of need. In conjunction with this, less than 5% of the companies that can or may purchase your product are actively looking to purchase your product. If at any point in time only 5% of the market is actively looking to purchase your product or service wouldn’t it be nice if you could target your marketing investments to target that 5%? This is what search marketing is all about; making sure potential customers that are in the market for your product are able to easily find you. While there is not a one size fits all approach to marketing in the majority of cases, I would argue that search marketing or “Being Found” marketing should be a significant priority. It is simply one of the most efficient and cost effective means of generating high quality leads. At the same time, search marketing will only take you so far. While some companies have been able to achieve significant success using search marketing exclusively, most companies recognize that to increase market share they must also be proactive. Taking a little extra time to reach out by using marketing efforts will typically increase awareness of a company and their brand. This is what I would refer to as the “push marketing” or “target marketing” aspects of “content marketing”. The marketer identifies a specific target “persona” and then works to “push” content out to that target, increasing engagement. If that target then in turn engages with the content they will become aware of your company and brand. The great thing about this approach in a digital age is that not only does it provide a means for getting your company known; it also provides digital bread crumbs that your sales team can use to in their sales efforts. If your business objective is to go after a specific target market your marketing team can publish content to that market and then provide your sales team information about whom in that market is engaging with your content. Rather than waiting for a lead they can now target their sales efforts towards those who have expressed an interest the content you are publishing. The more content you publish and the more engagement there is, the greater opportunity your sales team has to focus on the most active prospects on their hit list. When people talk about search engine marketing they generally relate it to a company’s website. A search engine optimization specialist optimizes the company’s website to be found. They do this with a combination of organic search engine optimization and paid search. The focus is driving traffic from the search engines to the company’s website. It is worth noting that in content marketing there is also a search engine optimization component. In other words when we publish content we want to optimize it so it is found on the search engines as well. This content is likely different than the content one would find on the main pages of a company’s website. This content is more likely found on a company’s blog or other type of informational resource. None-the-less, it all works together to establish greater visibility on the search engines. Greater visibility for the content which also helps to increase visibility for the website as a whole. In that sense, content marketing is an extension of search engine marketing. It helps to establish greater visibility on the search engines but also uses other channels such as social media, email marketing and video to spread your message to your market. Review your marketing strategy and analyze it from these two sides. 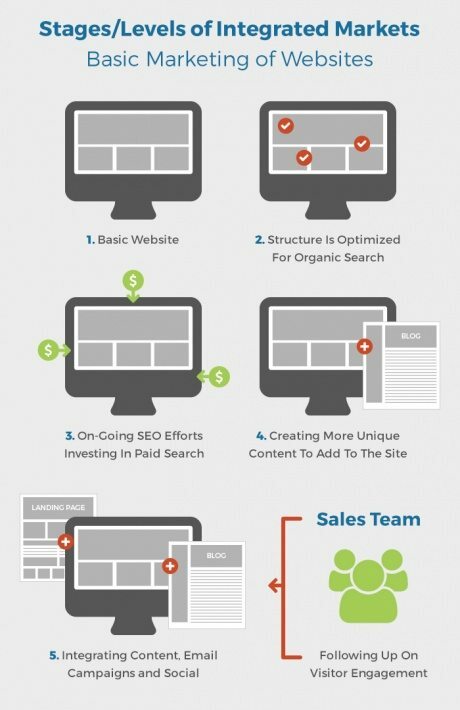 Do you have a solid search engine marketing strategy when it comes to your website? Are you combining search engine optimization and paid search to make sure you are found by those who have a need for your product or service? 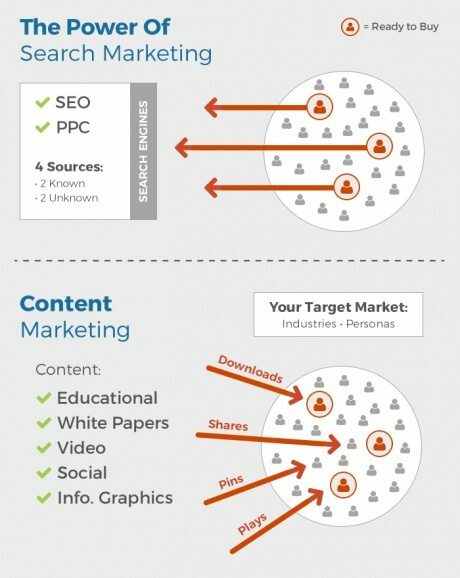 Have you established a solid content marketing strategy that is aligned with your sales and market penetration goals? Are you doing a good job of integrating your content strategy with your sales strategy?